Johanne Brunet is a Professor of Marketing at HEC Montréal. She teaches in executive programs, to EMBA and MBA students. 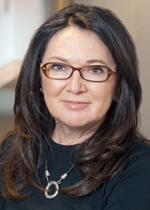 She is Co-Director of the « Catalytic Mindset » module of the EMBA McGill-HEC Montréal. Her research interests focus on creativity and innovation, strategic alliances, cultural industries and performance measurement. She obtained her PhD from the University of Warwick, United Kingdom. Before joining HEC Montréal, Professor Brunet worked in the media, at the Canadian Broadcasting Corporation and at TV5 America. Professor Brunet sits on numerous boards of directors, including those of the SAQ (Société des Alcools du Québec) and the SHDM (Société d’habitation et de développement de Montréal), both of which she chairs. She is a member of the International Advisory Board of Regent’s University in London, UK. She has chaired numerous committees and boards in the United Kingdom. In 1999, Professor Brunet received the ‘Action femmes d’affaires’ homage from the Board of Trade of Metropolitan Montréal. She was a finalist in the ‘International Business Professor of the Year’ competition organized by The Economist in 2013. Professor Brunet has published numerous articles and has co-authored several publications such as ‘Marketing Management’. She has also organized many International Campuses for MBA students in India, Australia, the United Arab Emirates and the United States. Professor Brunet is an associate member of the Carmelle and Rémi Marcoux Chair in Arts Management at HEC Montréal. She has lectured in many professional seminars in international executive programs in Canada, Europe and North Africa.